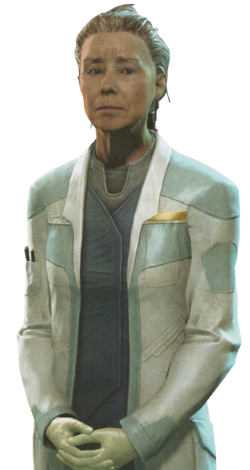 Dr. Sandra K. Tillson (Civilian Consultant Number: CC-728304) was an xenoarchaeologist in the employ of the Office of Naval Intelligence. In 2557, she was studying the Composer at Ivanoff Station. Sandra Tillson was born on May 14, 2506, on Coral. At some point of her life, Tillson studied and earned her doctorate in archaeology in the Pegasi Institute. She became one of only a handful of experts in the field of Xenoarchaeology, where she was then hired by the Office of Naval Intelligence to conduct research on a number of sites later deemed to be of Forerunner origin. When Installation 03 was initially discovered, she was one of the first people to be introduced to the research team. This lead her to be the one responsible for the discovery of the Composer. During the Raid on Ivanoff Station in July 24, 2557, she assisted in evacuating the station, while Master Chief John-117 cleared the station of Covenant attackers. Tillson volunteered to stay behind to detonate the HAVOK nukes the Chief and Cortana planned to destroy the Composer with. However, she was killed when the Didact activated the Composer, digitizing her and everyone aboard Ivanoff Station, save the Master Chief. Sandra Tillson was voiced by actress Adrienne Barbeau, who is best known for portraying Catwoman in Batman: The Animated Series. According to a Twitter post by Halo Waypoint, Tillson was born on Lodestone. Her birthplace was changed to Coral in Halo 4: The Essential Visual Guide. Portrait of Doctor Sandra Tillson carrying a Data pad. Renders of Doctor Tillson's face before, during and after being Composed. Doctor Tillson observing the Mantle's Approach on Ivanoff Station. Dr. Tillson undergoing the effects of the Composer.